As the first and last thing visitors to your home see, a driveway has a huge impact on how people view your property. Despite their prominent position, homeowners often let driveways slip into a state of disrepair or carry out poor-quality upgrades that soon crack or subside. Here at LA Builders, we provide a range of solutions for driveways in the Epsom, Reigate and surrounding Surrey areas that fit any stylistic taste and budget. Based in Banstead since our establishment in 1980, we have established ourselves as an expert builder and hard landscaping specialist for the region. We directly employ every CSCS and CIS-certified builder on our team, ensuring that our decades of knowledge and experience, as well as our quality standards, are always upheld. 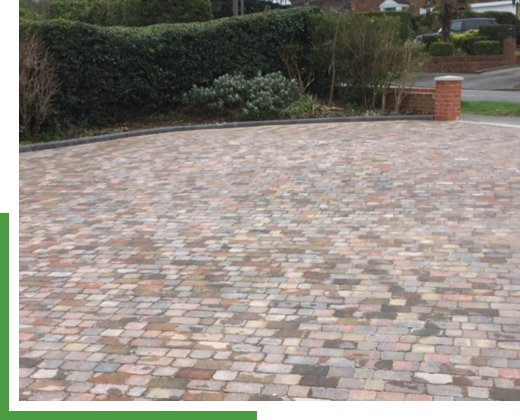 When it comes to driveways, it’s vital that our customers in Banstead, Epsom, Reigate and the wide Surrey area choose a material that complements their existing property as well as providing durability and functionality. Below, we’ve looked at our most popular materials for driveways and specified how they can benefit our customers in different ways. These driveways have become increasingly popular due to their aesthetic appeal and hardwearing nature. Due to the small size of the blocks themselves, these driveways need to be installed by an experienced builder in order to match the understandably high expectations of our Banstead, Epsom, Reigate or Surrey-based customers. LA Builders design and install block paving driveways to the highest standards, ensuring they remain intact for years to come. In the unlikely event of a block breaking, however, the whole driveway doesn’t need to be taken up, only the effected block itself. A cost-effective material, gravel driveways provide a suitable surface for any vehicle. As a natural material, gravel provides environmental benefits for homeowners in Banstead, Epsom, Reigate and Surrey; gravel driveways soak up water rather than sending it straight into the drain. With a variety of edging options to choose from, our gravel driveways offer a traditional alternative. As a high-density, low-absorption material, flagstone driveways have an incredibly high resistance to freeze-thaw cycles. In addition, the texture of flagstone is naturally cleft, which creates a non-slip surface during wet conditions. With a hardwearing, low maintenance nature, flagstone driveways have impressive longevity. Whether in the form of slabs or the poured variety, concrete driveways offer homeowners in Banstead, Epsom, Reigate and the neighbouring areas a cost-effective option. Easy to install, available in a wide range of colours and with the possibility for imprinted designs, concrete driveways have long since broken their stereotype as being simple and uninspiring. As a customer-focused builder and hard landscaping specialist, we offer an unconditional 10-year guarantee on all completed work.